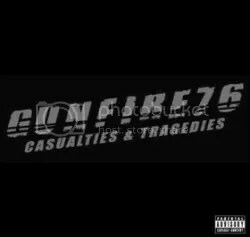 I recently came across Gunfire 76 because they were one of Amazon.com’s recommendations while I was viewing another artist’s album page. I’ve started to discover many cool bands based on their recommends! The band is one of a seemingly endless number of side projects for Wednesday 13 (what’s his main project?). I never got into Murderdolls so I wasn’t sure if this was gonna be something for me. I click on the samples, thought they were pretty cool and ordered myself a copy. On their MySpace page, Gunfire 76 cites New York Dolls, KISS, Deadboys and The Stooges as what they sound like and all of that is true and can be said for most projects Wednesday 13 is involved with but there’s a twist this time. Instead of the trashy horror punk Wednesday usually plays this album is glam rock meets classic rock meets punk rock. Lyrically, the album is a lot different too and while some song lyrics feature some of the signature angst from Mr. 13, there’s no B-grade horror movie lyrics to be found. The whole album is just so catchy. Listen to “Los Angel-Less”, “Something For The Suffering”, “One More Reason To Hate You”, “Back To The Gutter” (love the saxophone!) and “Get Me Through The Night” and try to get those songs out of your head. A song like “Get Me Through The Night” comes off like a great lost ’70s glam rock classic, I can hear Starz or Angel playing something like this or even Alice Cooper while “Tell You Like It Is” gives me a KISS vibe circa Rock and Roll Over. Wednesday 13 fans probably are already aware of this album but even if you’re not a fan of his usual stuff, anyone who like ’70s rock, glam and punk will really enjoy this one. Looking back, it’s easily one of the best albums of 2009. Nothing but fun from top to bottom… Too bad I didn’t listen to it until 2011!